Noam Elimelech, Chassidic essays on the Torah, by R. Elimelech of Lizhensk, with Likutei Shoshana and Igeret HaKodesh. [Shklow: Aryeh Leib son of Shneur Phoebus, ca. 1790]. Second edition. Rare edition of the Noam Elimelech, printed in Shklow, presumably between 1789 and 1794. This edition is unique for its noteworthy camouflage of the place of printing and name of printer. At first glance, the text of the title page is a copy of that of the first edition, including the names of the first publishers (with the omission of the place of printing and name of printer), however, careful study of the title page reveals that the place of printing and name of printer are alluded to through small circles above certain letters. The indicated letters make up the words: "Shklow, Aryeh Leib B.Sh.F (=Ben Shneur Feivish). The Noam Elimelech was one of the first Chassidic books, and is considered until this day to be one of the fundamental works on Chassidism. The teachings were recorded by the son of R. Elimelech of Lizhensk, R. Elazar, who showed them to his father and received his permission to print them. The book contains the essential part of the doctrine of R. Elimelech of Lizhensk on Chassidism, purity of thought and attachment to G-d. R. Elimelech had five disciples, who disseminated Chassidism to the Jewish people: the Chozeh of Lublin, the Maggid of Kozhnitz, R. Avraham Yehoshua Heshel of Apta, R. Izek of Kaliv and R. Mendel of Rymanów. Since its publishing, the book was deemed sacred to all, to the extent his disciple R. Mendel of Rymanów stated that only on Friday after immersing in honor of Shabbat is one able to grasp a little of the pure and lofty thoughts it contains. The Maggid of Kozhnitz would not welcome the Shabbat before he had studied his teacher's book (Encyclopedia L'Chassidut, I, p. 236). He would say that R. Elimelech would appear – after his passing – to his disciple R. Naftali of Ropshitz, to teach him Noam Elimelech (Igra Debei Hilulei, Ashdod 1999, p. 250). The Divrei Chaim of Sanz once remarked that he could compose a commentary on the Noam Elimelech just like the Beit Yosef did on the Tur, since it contained such profundity (Igra Debei Hilulei, Ashdod 1999, p. 235). Rebbe Eliezer of Dzikov once saw in a dream a house full of books, about which he was told that one book was the Noam Elimelech, and all the other books the house was filled with were commentaries to the Noam Elimelech (Ohel Elimelech, p. 80, section 193). R. Izek of Kaliv, after writing several hundreds of papers of commentary to the Noam Elimelech, heard a Divine Voice asking how he had the audacity to write a commentary to the Noam Elimelech, of which even angels and other celestial beings struggle to understand even one word or letter (Ohel Elimelech, p. 80, section 194). This book was reprinted in numerous editions (until 1982, it had been printed in over 50 editions, and since then in dozens more). Many keep the book as a segulah, and some special miniature format editions were published to serve as amulets for protection and success. Many put it at the head of an ill person as a segulah and protection, for a speedy recovery and to be saved from any misfortune. This book is known to be a segulah for women experiencing difficult labor (several Jewish hospitals throughout the world have a Noam Elimelech placed in a velvet pouch in the delivery rooms as segulah for easy births). This segulah is already mentioned in Shulchan Melachim by R. Moshe Tzvi Landau of Kleinwardein, who writes in the laws pertaining to women giving birth: "And the custom of placing a holy book wrapped in a cloth under the head of a women in labor has already become widespread – and the custom is to place the books Noam Elimelech and Or HaChochma" (pp. 38b-39a, Beregsaz 1931 edition). Various ownership inscriptions in the blank pages at the end of the book: "…belongs to the princely young man… R. Nachman", "The renowned philanthropist R. Aharon Dov of Pukhavichy" and others. Stamps of the Merchant's Kloiz in Kovno on several leaves. , 1, 3-89, 70-97; 19 leaves. 20.5 cm. Condition varies, fair-good. Most leaves in overall good condition, stains and wear. Tears to title page, affecting several words of preface on verso, repaired. Title page and subsequent leaf, leaves 4-5 of the first pagination and 5 last leaves, presumably supplied from another copy. Dark stains, tears and damage to these leaves, affecting text, repaired with paper. Minor worming to several leaves. Inscriptions and stamps on title page. New leather binding. Variant. Lieberman and the Bibliography of the Hebrew Book both record a copy with  leaves at the beginning of the book. In these listings, the second leaf contains the preface, printed over two pages. In this variant, the preface was printed in smaller font, on one page only, on the verso of the title page (compare to the scanned copy of the NLI in the NLI website and Otzar HaChochma; and see Stefansky Chassidut, ibid). 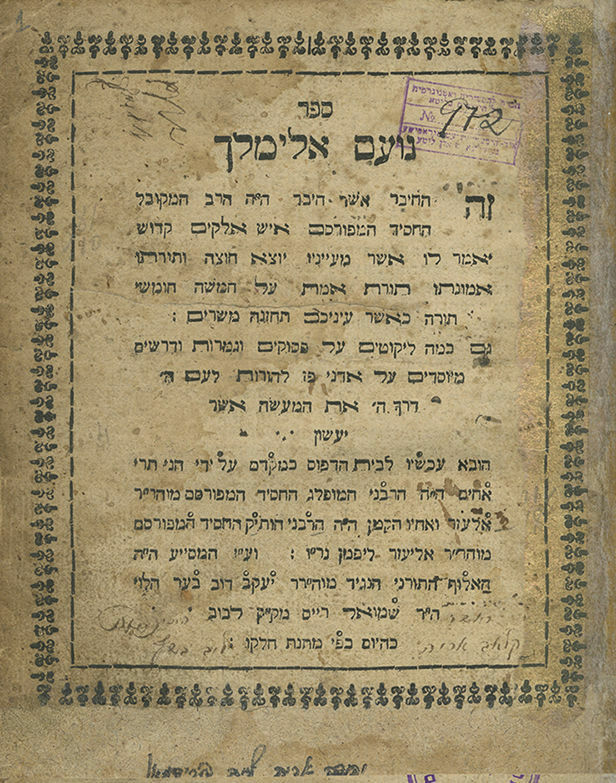 This is the first Chassidic book printed in Shklow, which in those days was the stronghold of opponents to Chassidism. The bibliographer Chaim Lieberman in his book Ohel Rachel (I, pp. 176-177) writes that this edition was probably published between 1789 and 1794, and calls our attention to the interesting phenomenon of printing a Chassidic book in Shklow of that time. He contends that almost no Chassidic books were printed in Shklow, apart from a few Chabad books printed after 1803. At the end of his thesis, he suggests that this edition may have been printed especially for Galician Jewry, and the place of printing was concealed to enable to book to be smuggled over the border more easily. Since the prohibition of printing kabbalistic books in Galicia was only enacted in 1794, he surmises that the book may have been printed only after 1794 (based on this, listing 000313521 of the Bibliography of the Hebrew Book gives the estimated date of 1795; other places however record the year of printing as 1790).